Since the seal must function as a slider or friction bearing, the seal has an unpredictable life span. The seal of a centrifugal pump is usually replaced many times during the life of a pump. All bearing need lubricant and the seal lubricant is the liquid being pumped. Liquid infiltrates between the contact faces of the primary and mating rings. Some of this liquid does find its way through to the atmosphere but is so slight as to only be noticed as corrosion of 'build up' on the pump adapter. The condition of the pumped liquid will greatly affect seal life. Shown : Pump seal in a centrifugal pump from a Sentra mold temperature controller. The forgoing is a brief discussion of some of the most common reason why seal life is shortened. 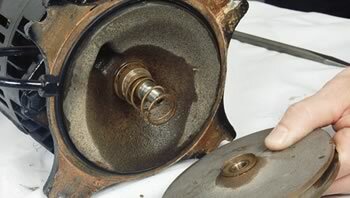 Under normal conditions, seals wear out much faster than the other pump parts. Abrasives and excessive heat greatly shorten the seal's life span. Would you like to Download FYI #227 to your browser?